Heritage Ranch is one of the biggest age-restricted communities in North Texas. It's also one of the most affordable. In Dallas-Fort Worth, active adult homebuyers can discover many 55+ communities with homes at affordable price points. Whether retirees want to live in a neighborhood with a vibrant social scene, a stunning golf course with lake views, or they desire a more laid-back lifestyle, they can find the place that fits their budget in North Texas. The region is home to more than two dozen age-restricted communities that provide a variety of homes and an stress-free lifestyle while allowing active adults to live within their financial means. Here’s a look at some of the best lowest-priced communities in North Texas. Heritage Ranch in Fairview provides a fine quality of life while remaining financially feasible for many active adult homebuyers. Those who want to pursue a truly active lifestyle will delight in the many clubs and groups offered in this 50+ community. Residents can befriend like-minded others and enjoy their favorite hobbies through book reviews, art classes, water aerobics, and yoga. A full-time activities director keeps the social calendar full with trips, workshops, and classes. Heritage Ranch is a golfer’s dream, home to an 18-hole, par-72 championship golf course designed by renowned Arthur Hills. The community also contains a majestic 24,000-square-foot clubhouse, an on-site restaurant and lounge, indoor and outdoor pools, four lighted tennis courts, horseshoe and bocce ball courts, and four miles of hiking and biking trails that wind through the woods. Set amidst 575 acres in the country, this tranquil community contains 1,144 single-family homes and attached villas available on a resale-only basis. Many homes feature outdoor patios, granite countertops, and golf cart garages. Only 45 minutes from Dallas, Del Webb at Union Park will give active adults the best of resort-style living without going beyond their budget. Situated within a master-planned community in Little Elm, Del Webb at Union Park will stay true to the Del Webb brand, giving active adults many desirable amenities. Residents will be able to relax at the sparkling outdoor pool, socialize with friends in the clubhouse, or meet up with neighbors for painting or a card game. From picturesque walking trails to bocce ball courts, tennis courts, and a fitness center, this neighborhood gives homeowners an array of options for staying physically fit. Discerning active adult homebuyers will relish the opportunity to select from 10 different single-family home styles that range in size from 1,400 to 2,500 square feet. Depending on the model, homes will feature two or three bedrooms, two or three bathrooms, and a two-car garage. Ladera Mansfield offers active adults a taste of the high life but without the high price tag. Situated in the desirable community of Mansfield, this brand new 55+ community is perfect for active adults who desire modern homes in a close-knit neighborhood. Currently underway is a 4,500-square-foot clubhouse that will serve as a hub for social gatherings and physical recreation. Homeowners can relax in the media room for movie nights or host a laid-back dinner party in the catering kitchen. 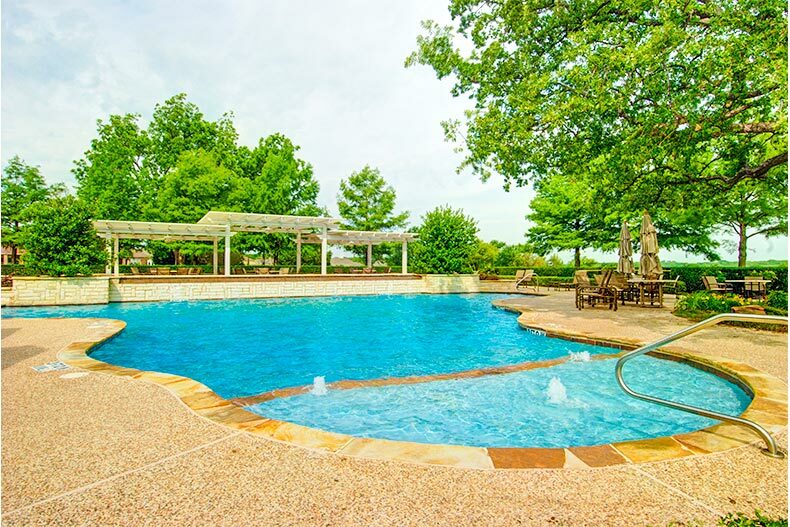 When the sun sets, residents can enjoy a pleasant Texas evening at the outdoor heated pool, which includes a patio and firepits. Beauty abounds in this serene community, from the neighborhood’s parks and open space to the scenic ponds and miles of walking and biking trails. Started in 2015, Ladera Mansfield will contain 186 homes upon completion. While most will be single-family homes ranging in size from 1,519 to 2,511 square feet, active adult homebuyers can also explore two floor plans for attached homes, which contain 1,390 or 1,494 square feet. Elegant touches such as tray ceilings, crown molding, and granite countertops add to each home’s appeal. Active adults don’t have to pay top dollar to gain access to desirable amenities such as a private clubhouse, fitness complex, sports courts, lakes, and more. Isabella Village at Savannah, a 55+ community situated within the master-planned community of Savannah, provides a rich quality of life at a price that’s within reach for many active adult homebuyers. Residents can enjoy private access to Club Isabella, an amenity center packed with opportunities for active adults to stay physically and socially active. Club Isabella includes a fitness center and aerobics studio along with a multi-purpose room, card tables, and a catering kitchen. Pet owners will appreciate the on-site dog park while outdoor enthusiasts can take advantage of the neighborhood’s five fishing lakes, covered basketball court, sand volleyball court, pool, and patio. Homes in this luxurious community range from 1,212 to 2,398 square feet and include many energy-efficient features along with high-quality finishes such as cultured marble tops, built-in Whirlpool Energy Star appliances, and custom oak cabinets. Eco-minded individuals will appreciate that Nathan Carlisle Homes uses eco-friendly building methods to cut back on costs and environmental impact.